Last week, we had the opportunity to speak to Elizabeth Fisher, the Executive Director at Good Food for All. Good Food For All is a non-profit organization that provides after school programs in the form of food and nutrition education to youth aged 13 to 19 years old in East Vancouver. Along with food and nutrition education, they also provide snacks to the youth 5 times a week, and have been doing so for almost 3 years now. As a customer of Flashfood app, we were thrilled to talk to Elizabeth about this amazing project and also learn more about why she uses Flashfood. FF: How did you get the idea to do GoodFoodForAll.Org? ELIZABETH: I grew up in Vancouver, and I left for about 10 years to attend school at McGill University and NYU, where I pursued a Masters degree in Non-Profit Management. I knew that I wanted to do my own non-profit when I got back. But, I didn't want to do something in drug addiction because there were already a lot of organizations tackling drug addiction issues, and they were much better equipped. One day, I read an article about how every few years the school district funds are redistributed because of changing demographics. Higher income families were moving into the lower income area of East Vancouver. As a result, the funding that went towards hot breakfast and lunch programs for kids was cancelled. I was really angry after reading this - it was kind of my "ah ha" moment. I knew that this was the non-profit I needed to create. I'm also passionate about food, so this was a natural fit for me. After a lot of research, I was astonished to find out that quite a lot of young kids were not getting hot breakfasts and lunches, and that a ton of kids in East Vancouver were going hungry, 1 in 3 people who visit the food bank are kids. My focus of our program is food security. Meaning, we provide them with after school snacks, a food pantry, plus nutrition education in direct response to what kids were asking questions about. Many of the kids making use of our program are kids who are considered to be at risk, have been, or are still in the system, were kicked out of school, or generally don't have much stability in their lives. FF: How has Flashfood helped with your mission? ELIZABETH: I'm against the idea of a two tiered food system. So many people in Vancouver are so healthy with their juice fad diets and their wheat grass smoothies, but then there are these young people who are in need and all they have is a cup of noodles from the food bank. That shouldn't happen. There should be food equality. I want to serve the kids locally sourced, organic, super foods as often as possible. If anyone needs it, it's these kids. They have a history or not having the greatest nutrition. What I really like about Flashfood is that it lets me buy these super expensive foods for half the price. I bought these hemp hearts for half the price, and the kids went crazy for them. They were so excited that they tore open the bag and started putting it on their yogurt and salads. One kid asked if she could get more, and some kids were eating it by the handfuls. FF: When I was growing up, I remember eating a lot of junk food and being forced to eat my veggies. How do you get these kids to eat so healthy?! 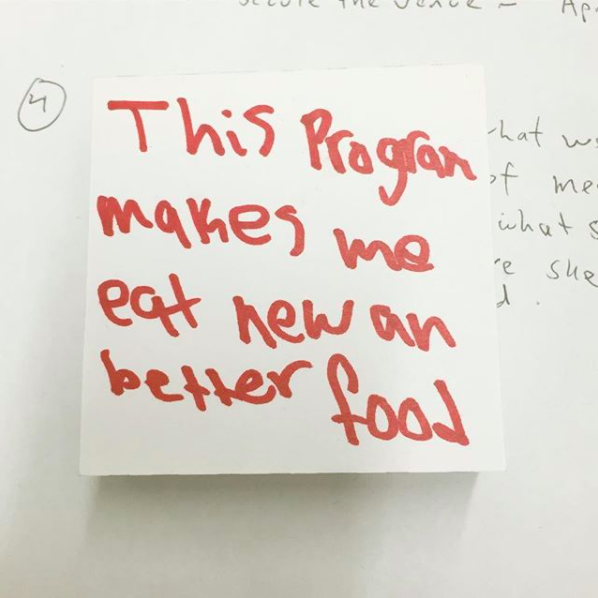 ELIZABETH: Once the kids come into the program, they're hesitant to try new things, but once they see the other kids eat the healthy food, they're more likely to try it. Kind of like peer pressure! On average, it takes 9 tries for a kid to try a new food. They need to be exposed to it before they like it, they tend to be more picky because they haven't seen it before. I'm all about being food positive, and I keep repeating that the food they are getting is fuel, and that they can eat as much as they want. 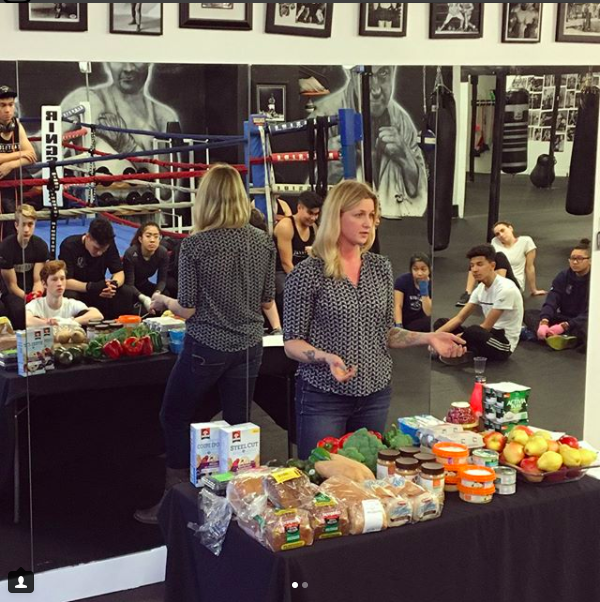 I also do talks a few times a year to emphasize pre and post workout nutrition, as a lot of the kids are doing boxing class for 2 hours, so they get super hungry. FF: How can others get involved? ELIZABETH: People can get involved by donating, and any connections with grocery stores or food producers where we can get actual donations of food are really helpful. You can make a donation here and get in touch with Elizabeth here.